These grilled hot wings are savory, sweet, and just a little spicy thanks to the Nando’s Peri Peri Sauce I used in the marinade. I wasn’t paid to write about Nando’s, but they sent me some free sauces to review, including the Garlic Peri-Peri Sauce that ended up on these grilled hot wings. I really enjoyed the sauces and created a couple recipes to share, including a delicious Spicy Chicken and Pineapple Pizza. I had never cooked chicken wings before but I decided I wanted to grill them rather than fry or bake them. I turned to my all-time favorite book on grilling, Elizabeth Karmel’s Taming the Flame and sure enough, she had instructions for grilled Buffalo-Style Chicken Wings. I adapted the recipe a little but definitely can’t take credit for creating this one! I used a bag of frozen chicken drummettes, but you’re welcome to use whole wings if that’s what you prefer. This recipe uses a combination of indirect and direct grilling. If you don’t understand the difference, read this before you get started. I didn’t specify exact amounts of seasonings—you know better than I do how much garlic you like! These wings have a little kick but they really aren’t too spicy. Although these aren’t as spicy as traditional buffalo wings, the Nando’s Garlic Peri-Peri Sauce really gives them a wonderful flavor. I have to say that I enjoyed these grilled chicken wings as much or more than the wings I’ve had in restaurants and bars. They also got several thumbs up from the group of Sailors here that I recently recruited to be Pinch My Salt taste-testers. Thanks guys! 1. Light briquettes or preheat a gas grill. 2. Defrost chicken pieces and pat dry with paper towels. 3. Put chicken pieces in a large bowl; drizzle with olive oil; season with garlic powder, salt, and pepper; stir until all pieces are coated. 4. Grill chicken pieces, covered, over medium indirect heat for 20 – 25 minutes, turning once halfway through cooking time. 5. While chicken is grilling, combine hot sauce, butter, and honey in a small saucepan. Bring to a slow boil, whisking occasionally, and reduce heat to low. Season to taste with salt and pepper. 6. Take 1/3 of the sauce to the grill and brush on the chicken. Grill for an additional 5 -10 minutes. 7. 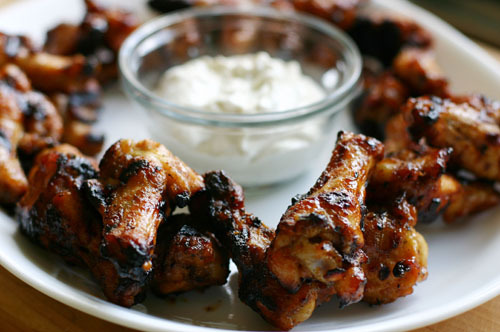 Remove wings from grill and place in a clean bowl. Pour remaining sauce over the chicken and stir until they are well coated. 8. Return the chicken to the grill, this time over direct medium heat. Grill for a few minutes on each side until brown and caramelized. Watch chicken carefully because it will burn quickly! 9. Serve warm with blue cheese dip. Oh my! I go crazy for wings and these sets my drooling to Niagara Falls mode. One way to kick up your wings is to deep fry them for about 4 minutes, which helps with the skin a bit, then put them on a grill with indirect heat, with some wood chunks in the coals or wood chips over the flame to finish them. You end up with great wings with little chance of burning them over a fire. They're called 'smo-fried'. These look sooooo Yummy! I'm not a huge fan of wings but I think I would like these! What a great looking recipe. More yummy Nando's! These would be a hit in a Brazilian barbecue, Nicole! Nicole, this picture is so cute. I like this recipe, because I could prepare it for my parties, and I think people will enjoy it. It's almost lunchtime, and suddenly, my healthy little salad just isn't so appetizing anymore! When we moved, I couldn't decide whether to junk our banged up old Weber kettle or move it. Reading this post, I'm really glad I moved it! These look soooo good! I love wings. Those little wingies look awesome! I may have to kick 'em up a bit with some heat. great! I am all over these. I have been craving wings for weeks now. Those look absolutely awesome! I shall repeat myself.. I'm glad I don't do a food blog and have to compete with you. "a little kick?" What does that mean? mmmmmmmmm nandos, this wings look like perfection! yum! yum! yum! Really fantastic pics. Thanks! Nicole, Nando's chicken rocks! I'll try your version at home...thanks! Recently had Nando's for the first time while in Melbourne. Its not bad but is pretty vinegary and bland, even their extra hot sauce is bland.... :( sounds like your recipe would be better. My favorite stuff!! !....I have to try it!! !